Serenissima is a Wedding Planning agency based in Venice Mestre. Our team is made up of an array of Professionals for ceremonies in Venice, specialized in the organization of Civil Weddings in Venice and Veneto, Religious Weddings in Venice, beautiful Symbolic Wedding Ceremonies in Venice and in Verona, Wedding Proposal in Venice and in Verona, Anniversaries and Birthday Parties. We do everything we can to choose the most beautiful settings for youy Special Day. Whether you want it to be in a : high-class restaurants facing the Grand Canal or on the panoramic terraces dominating the Lagoon of Venice, luxury hotels, the historic Venetian Palaces and their secret gardens, Venetian Villas and Medieval Castles, Venetian Islands or even a real Pirates’ Galleon ... We will make sure you. If you have something different in mind, we welcome any suggestions you can give, so that we can make sure your day is truly SPECIAL. The evening has fallen over Venice, the lulling waves of the lagoon accompany the notes of a night serenade. Only you two on the “gondola”: gently rocked by the water, sliding past the spectacular facades of the elegant buildings facing the canal. Tomorrow is your Wedding Day, right here in Venice. For many this is only a dream. At Serenissima we can make your dream come true. Imagine the most beautiful day of your life in the most romantic city in the world: you can get married in the city hall situated in the suggestive Palazzo Cavalli, on the Grand Canal; on a Gondola or in the shade of a Secret Garden of an ancient Venetian Palace. We’ll personally assist you from the moment you arrive in Venice and we will be by your side during all the preparations: flowers, make-up, hairstyle, wedding dress, tuxedo, photographs, video shots, wedding reception, assistants and interpreters. We will be by your side every step of the way. Together, we will make your ceremony more romantic you could have ever imagined. 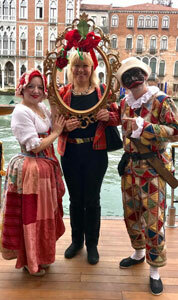 Renewal of Vows and Wedding Anniversary in Venice, the most romantic city in the world. Venice’s canals are magic, not only for weddings. Venice evokes a myriad of emotions, whether you are renewing your vows, celebrating an anniversary or just have an important event. We will organise everything, so that everything is be perfect. Are you looking for a Symbolic Wedding Ceremony, awaiting or following the real one ? These rituals have no need for bureaucratic authorizations and can be celebrated wherever you like: it can be in one of the magnificent palaces on the canals of Venice or on a gondola, steered by an authentic “Doge” : your choice ! What about doing your Proposing in Venice ? While the love of your life is imagining only a simple holiday in Venice, we will organize a surprise proposal for you. We can assure you that she will remember your Wedding Proposal in Venice for therest of your days together. If you’re thinking about a party to celebrate an important event, Venice may be the perfect place. We can organise a costume-parties, with sumptuous 18th century gowns and garments, in order to live again the lavishness of the past, dancing in the halls of the most beautiful buildings on the lagoon. Trust us with your heart. Your ceremony will remain one of the most amazing memories in your life.